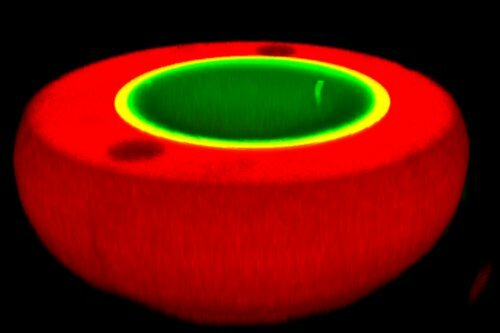 Confocal fluorescence microscopy image showing a cross-section of a host-guest nested protocell consisting of a captured guest proteinosome (green) trapped inside a host coacervate micro-droplet (red). Image credit: Professor Stephen Mann and Dr Nicolas Martin, University of Bristol. The work opens new perspectives to develop synthetic soft materials endowed with life-like properties. Living cells cooperate and compete with each other to maximise their survival and optimise their collective behaviour. Reproducing these behaviours in communities of synthetic cell-like entities (protocells) is extremely challenging and requires different types of protocells to be brought together in close proximity so that they can operate in unison, or alternatively, work against each other. In a new study published today in Nature Communications, Professor Stephen Mann from Bristol’s School of Chemistry, together with colleagues Dr Nicolas Martin, Yan Qiao, Richard Booth and Mei Li in the Bristol Centre for Protolife Research, and French collaborator Jean-Paul Douliez from the University of Bordeaux have addressed this challenge by designing two types of enzyme-containing protocells, which when mixed together spontaneously assemble into nested host-guest communities that operate synergistically or antagonistically depending on the strength of a chemical signal. The team used large droplets of a pH-sensitive fatty acid complex (coacervate) and small protein-polymer microcapsules (proteinosomes) as the host and guest protocells, respectively. By engineering attractive interactions between the two types of protocell, the proteinosomes were spontaneously captured and internalized in the coacervate micro-droplets to produce a nested community. The researchers enzymatically charged the nested community by trapping glucose oxidase and horseradish peroxidase inside the proteinosomes and coacervate micro-droplets, respectively. Addition of low amounts of glucose into the environment produced a cooperative interaction between the host and guest protocells such that the two enzymes worked together to produce a spatially coupled chemical cascade. However, increasing the level of the glucose signal turned the guest protocells against their host which led to the pH-induced disassembly of the coacervate droplets and release of the resident proteinosomes. A surprising feature of the self-reconfiguration process was that the droplets restructured into small fatty acid vesicles that became trapped inside the ejected proteinosomes to produce a new type of nested protocell. ‘Antagonistic chemical coupling in self-reconfigurable host-guest protocells’ by N. Martin, J.P. Douliez, Y. Qiao, R. Booth, M. Li and S. Mann in Nature Communications.